When it comes to guaranteed money savings and economical, efficient operation of a vast array of facilities, using thermal insulation is like "solid gold." Other devices and approaches in the "gold-plate" category, such as timers, logic controllers, and even energy conservation training, are a distant second. But there’s one aspect of thermal insulation’s overall use that has been historically overlooked or poorly-regarded: the use of removable-reusable insulation systems. With rising energy costs and the unwanted environmental emissions accompanying lost energy, the time has definitely come for facility owners, operators and energy managers to fully take advantage of this valuable money saving, energy conserving and emissions reducing tool. though in some instances the reputation may have been deserved due to incorrect specification, out-of-date construction methods, poor fit, and use of less than optimum materials for the application. But "giving a dog a bad name" shouldn’t detract from the excellent products that are available. To make the point even further, this type of insulation use should more correctly be named and regarded as that of "removable-reusable insulation systems." A facility-wide approach to specification and selection of removable-reusable insulation systems is important. It’s vital in reviewing and determining where these systems can be used and how to gain optimum results. A comprehensive review helps blunt the tendency to simply pick out single random pieces of equipment in a process-chain, to the exclusion of all others. Doing anything other than a full review doesn’t really make sense-certainly not from an economical standpoint in terms of operating or maintenance cost, nor process stability, or with regard to the environmental emissions which accompany lost energy. An example of this approach’s outcome is shown in photo of a pumping station and reactor lines (see Figure 1 at left). In the photo, all equipment that might otherwise be left uninsulated, either due to its awkward shape, location, or need for quick maintenance accessibility and fast return to service, has been insulated with a removable-reusable system. The component parts consist of removable-reusable insulation to cover the pumps, instrumentation, pump inlet and outlet valves, check valve and the reactor lines in the background. For a closer look at removable-reusable insulation covering various types of equipment, take a look at the pictures of the twin pump station (Figure 2), the motor driven butterfly valve (Figure 3) and the gate valve (Figure 4). Performing such a facility-wide review may seem daunting, but to simplify this task, break it into manageable parts. Divide the overall facility into its various systems. For example, in a thermal power plant, boiler water feedheating and turbine condensate collection would be examples of systems. From this list, perform a drawing and/or process & instrument diagram (P&ID) review to help identify and list hardware items in the system. Then perform a field review. This examines the equipment as presently installed and how it’s insulated. From the field review, create an action list of all those items of hardware that are uninsulated, poorly insulated, or traditionally difficult to insulate with "rigid" insulation. Factors which play into this include the shape, size, maintenance requirements, location, elevation above ground, physical environment the equipment is in and myriad other reasons. In conducting the field survey, don’t forget such none-obvious items as pipe spools, manways and flange joints. From this review, equipment that has traditionally been left bare, unaddressed, or inconveniently covered with traditional rigid insulation and metal are prime targets for covering with removable-reusable insulation systems. 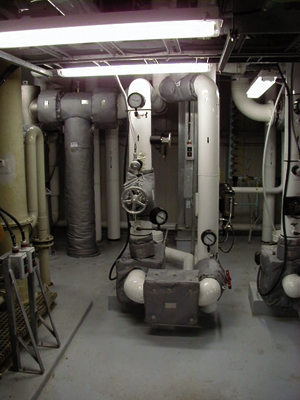 The identified equipment is gaining or losing heat, wasting energy, and costing a significant amount of money in operating and maintenance costs. As an aid to this review, contemplating other industries where removable-reusable insulation systems are extensively used also helps focus attention on identifying the type, need and locations for installation. 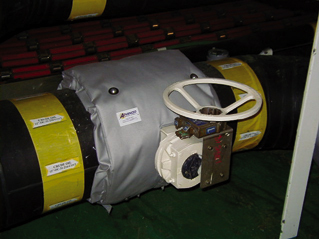 Removable-reusable insulation systems are extensively used in the offshore oil and gas exploration industry. One example is the Hibernia Oil and Gas rig pictured at the top of this story. There are several reasons for use in this and other marine applications. Though these are specific reasons for marine applications, they’re no less applicable to all manner of land-bound facilities, no matter how large or small. So it’s important to closely review all factors and reasons for insulating. Having completed the field and drawing review, and considering where these systems will be used, you’re ready to commence the outline specification required for ultimate purchase and installation. This way the insulation, and not your wallet, can start taking the heat. At the outset it’s paramount to understand, in contemplating using removable-reusable insulation systems, that they must be properly specified and professionally designed and manufactured from quality materials to be durable, effective and reinstallable many times over. If we take a look at these in turn, we will be able to highlight factors that are important to specifying types of removable-reusable insulation and to guarantee their success. Removable-reusable insulation has four basic parts: liner, insulation, outer jacket, and closure. Let’s take a look at each of these, beginning with liners. One of the first considerations in selecting a liner material is the hot (or cold) face temperature on which the insulation will be installed. Some viable materials, and an outline of their general limitations are listed as follows. This material is a very good selection for functional all-round general service. The matrix cloth is usually a glass fiber weave with a through-thickness impregnation of high-temperature silicone. This cloth is very flexible and easily handled. Upper temperature limitations for this material are in the range of 500 degrees fahrenheit (F) for continuous use, but above 500 degrees F can they take intermittent exposure of up to 700 degrees F for an accumulated time of about 100 hours. This material can be used at temperatures up to 500 degrees F. However, one constraint is that in humid or wet environments, moisture and heat can deteriorate the base cloth. This should be considered when contemplating outdoor applications, or use on steam or hot water systems where the potential for leaks exist (at valve bonnets or pipe flanges, for example). This is material that may be used on low-temperature applications. It’s reasonably flexible and low cost. The aluminum foil serves as a barrier to retard fluids entering the insulation layer from the inside. Its temperature limitation is about 200 degrees F. Above this temperature the lamination bond tends to break down due to adhesive degradation and the aluminum flakes. The foils used for this material are quite heavy (generally around 3 mils). Using this material provides a puncture-proof liner. However it can’t be folded due to its lack of flexibility. It also can’t be sewn. Construction of the finished product entails using "hog rings" to join it at the edges of the liner, to the outer jacket. This joining method has now become virtually obsolete in manufacturing quality removable-reusable insulations. Woven silica cloth is used as a liner for very high temperature applications (up to 1,800 degrees F). Its main limitation is that it’s difficult to work with and frays easily. Various insulation layers are available. These include the following. The usual candidates are available for this application. They include both rock wool and fibrous glass wool held together with an organic binder. Selection of this insulation material depends on the application. The main considerations, in addition to thermal conductivity, are the flexibility of this layer for handling during many installations and removals over the life of the finished insulation. Also, resistance to compression has to be considered. Compression could reduce the effective thickness of the insulating layer. These don’t use the usual organic binders to hold the mat together. They’re nonwoven and held together by mechanically "needling" the internal fibers of the mat together using a special process. The usual organic binders start to decompose (oxidize) at around 400 degrees F. Use of organic binders above this temperature would cause loss of binder and cause degradation of the insulation to an extent that it would compress and lose thickness due to diminishing compressive strength. Also, loss of binder could lead to disintegration of the insulation layer. Needled man-made mineral fibers would therefore generally be used on installations operating in temperatures ranging from above 400 degrees F up to about 1,000 degrees F. Needled ceramic mat would be used in the highest temperature applications. These may be specified and used depending on the application. There are several examples of outer jackets. For functional all-round general service, this material is also a very good selection as an outer jacket, as well as a liner. The matrix cloth is usually a glass fiber weave with a through-thickness impregnation of high temperature silicone. This cloth is easily handled, impervious to the elements, very flexible, has excellent tear strength and is resistant to cracking, even in sub-zero temperatures. Though this material can be pressed into general service, it’s best reserved for special applications in special environments. For example, these include environments subject to very aggressive corrosive attack, which would degrade other materials, or where complete cleanability and washdown are critical. Examples of the latter are in the food, pharmaceutical or nuclear industries. One of the limitations of this material is that the fluorocarbon is coated onto the base glass fiber cloth, not through-thickness impregnated. A coating outcome is that the material wrinkles easily (think linen shirt versus permanent press). When the cover cools and is handled during several installations and removals, especially in cold temperatures, the material and coating tends to crack along the wrinkle lines. With the aluminum foil presented on the outside, this material gives a consistent look to an overall insulation installation. It’s low cost, but doesn’t have high puncture, weather or fluid-ingress resistance properties. It has the same limitations to steam and temperature exposure when used as an outer jacket as when used as liner, as mentioned earlier in this article. Use of this material provides a puncture-proof jacket. However it retains the same constraints when used as a jacket as it does when used as a liner: It can’t be folded due to its lack of flexibility, and it also can’t be sewn. Construction of the finished product entails using "hog rings" to join it at the edges of the jacket, to the inner liner or to an intermediate gusset. This construction method makes the overall finished piece of insulation difficult to weatherproof if used outside, or to prevent the ingress of fluids to the insulation layer if used indoors. Also, except in specific applications, use of hog rings as a joining method has now become virtually obsolete in manufacturing quality removable-reusable insulations. This mesh can be added over any jacket to provide tear resistance (but not puncture resistance), to a jacket. Think of it as a kind of "chain mail" or "rip-stop" mesh for the jacket. Use of this mesh is now also becoming obsolete now that higher tear-resistant materials for constructing the outer jacket are available. Also, historically, this mesh has been hog-ringed in place, thus introducing the same weather and moisture-ingress problems as the previously mentioned stainless steel foil laminated to glass fiber cloth. Vinyl outer covers in colors such as bright yellow and international orange can be supplied to the shape of removable-reusable insulations. The intent is to give the equipment high visibility. This can be for safety reasons, such as warning personnel to stay clear or use safety equipment. Steam pressure relief valves (PSV’s), are a good example (as shown in Figure 5). 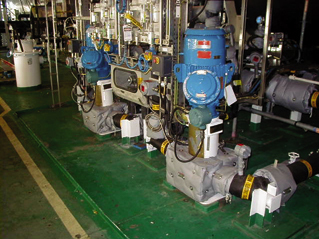 The noise level in proximity to large steam PSV’s when they release is high enough to burst eardrums and cause hearing damage. 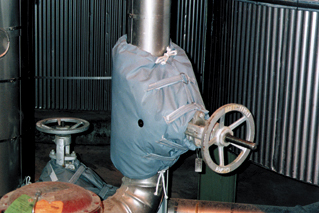 Once the removable-reusable insulation piece has been fitted around the piece of equipment to be insulated, some type of closure is required to hold it in place. There are several types of closures, including the following. The strap is threaded through a stainless steel D-Ring buckle, doubled back on itself and pressed closed. This makes a good and strong durable closure and lends itself well to rapid removal of the removable-reusable insulation for maintenance. These are generally used for extremely high temperatures. The closure ligament used for lacing the removable-reusable insulation closed through the lacing anchors is generally 18-gauge stainless steel wire. This remains strong and serviceable in elevated temperature applications. The analogy here would be comparable to tying your shoelaces. Stainless steel grommets are installed along the closure edge of the removable-reusable insulation. Light "ropes" are threaded through the grommets and laced up to provide a good closure. The ropes can be made from quite ordinary or quite sophisticated materials. These can include: glass fiber, Nylon, Kevlar, or Fluorocarbon impregnated as may suit the application and operating environment. Do they have experience in the insulation industry? Are they a well established and dedicated full-time manufacturer, with removable-reusable insulation systems as their prime product? Are they experienced and capable field personnel able to make field measurements? Are they experienced and capable designers who can translate the field measurements into removable-reusable insulation designs? Do they have an experienced work force to manufacture the removable-reusable insulations? Do they have a good list of projects, both large and small, and in diverse applications, which can be referred to by potential purchasers? Do they have a thoroughly complete, available and professional presence and support staff to fully specify, design, manufacture and deliver their products for installation and use? Is installation assistance and follow up available, if required? Do they have a formal quality management system to support and guide all of the previously mentioned factors? If you’re considering a supplier who can’t meet all of these criteria, think twice. You usually get what you pay for. When considering tenders, bids and quotes, don’t fall into the trap of just accepting the low bid. Accept the lowest-priced technically acceptable bid. A good bid supplies an excellent, durable, well-designed product, with all the professional, manufacturing, installation and follow-up support provided as a routine service. an estimate/budget quotation with or without manufacturer’s site review, as needed. finalization of the design and production of the manufacturing specification. the manufacture and delivery of the finished removable-reusable insulations to the customer, complete with instructions on installation. ongoing quality management throughout all of the previous steps. customer and follow-up support as needed. We have already covered outline review and specification, so let’s take a look at the balance of steps in product design and manufacture. A rough quotation and budget estimate should be available to the buyer following receipt of an outline specification listing what removable-reusable insulations are needed. This can be further developed through discussions with the supplier. To augment this, quality removable-reusable insulation manufacturers should be able to conduct a site survey and present an estimate or quotation on larger (and sometimes smaller) jobs. During a site review, the manufacturer will make site measurements and take notes of the operating parameters, operating conditions, physical location, dimensions, heat tracing, space constraints and adjacent equipment and processes. From this information, a design sketch will be produced. The information on the design sketch and site measurements will allow the design to be completed. It should be noted that thorough, skillful design is essential to manufacturing a functional and well-fitting removable-reusable insulation system. This information is then transferred to a design and manufacturing sheet, which forms the manufacturing specification and goes to the layout and cutting table. It shows layout and dimensions for the liner, insulation layer, jacket, closures, and miscellaneous gussets. It also should show the materials to be used and the manufacturing inspection points and requirements. Again, it’s critical that professional, experienced full-time production staff lay out, cut, assemble, sew and inspect the liner, insulation layer and jacket into the final removable-reusable insulation piece. This is a highly skilled job, and the final product should fit like a kid glove or a Saville Row suit. If it doesn’t, something is wrong. The methods of joining the various parts of removable-reusable insulations together have become increasingly sophisticated. Top quality covers will now be more inclined to be sewn instead of hog-ringed together. Extremely durable high-tech threads, including Kevlar-coated stainless steel thread, Teflon-coated glass, polyester, and plain Kevlar threads are available for this task. The picture shows some of the design layout and quality control inspections being undertaken on a partly finished insulation piece. The complexity of manufacture is reasonably evident in the picture. Overlapping flaps are visible, showing the detail needed to help keep the elements and errant fluids out, and the inner insulating layer dry. There are many other nuances of design and manufacture of first-rate removable-reusable insulations that extend far beyond the space available for this article. These all come from field and manufacturing experience and are integrated into designs by experienced manufacturers. Finishing of removable-reusable insulations is also very important to long life and durability. Some finishing operations include labeling, along with integrating quilting pins into the finished product. Using quilting pins is important. These prevent the internal insulation layer from shifting between the inner liner and outer jacket. If electric tracing is present, or no abrasion is allowed against the insulated face of the equipment, then the quilting pins may be capped with "dome" caps to prevent damage to the tracing or equipment surface. Finally, identification of the individual pieces of a removable-reusable insulation system is important. The labeling should be durable and strongly attached. Embossed metal plates meet these criteria. Information included on the labeling might include the manufacturer name, the job number and the customer purchase order number. It might also include the manufacturer’s piece number tied back its quality management records, the process system on which the removable-reusable insulation system will be installed, and the particular piece of equipment on which the removable-reusable insulation piece will be installed and remain. Labeling is important since, when the in-field design sketch was made, the closures on one piece of insulation may have been placed in a different orientation than another piece, even though it’s fitted on identical equipment. This choice of closure orientation, for example, may be due to such factors as interference with adjacent equipment, or placement of the closure such that it’s oriented for easy access for maintenance, particularly if above grade. Other factors may include identical valves having their bonnets rotated and installed at different orientations on the bolt-circle pattern. The nuances are too great to mention here, but must be considered. These are the hallmarks of a professional manufacturer. A formal quality management system should be in place to ensure consistency of manufacture of removable-reusable insulation. That there should be full manufacturer support through all phases of specification, design, delivery, installation, and after sale support shouldn’t even be a question. It’s essential to customer satisfaction and durable well-designed products. most often in less than a year; sometimes in a matter of months. The dilemma of "If I cover it with rigid insulation to save energy, I lose maintenance accessibility" no longer exists. With removable-reusable insulations, savings can now be realized by insulating equipment that was previously awkward, inaccessible, impractical or expensive to tackle with rigid insulation. 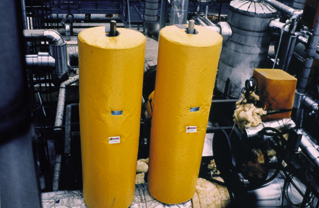 The initial overall cost of covering a piece of equipment with removable-reusable insulation may be somewhat higher than with rigid insulation. It depends on the application. But payback can be determined reasonably precisely by a quick engineering analysis of the application. Also the initial price advantage offered by rigid insulation disappears quickly the first time it has to be removed and replaced. Further the waste from the removed rigid insulation has to be disposed of, and will generally end up in a landfill. The second area of savings stems from shortening process downtimes and outages. Rapid, easy maintenance accessibility to hot equipment and fast return to service mean less downtime. The marginal hourly cost of having a high-volume manufacturing or industrial process taken out of service for forced, routine or planned maintenance can be tremendous. Finally, the third potential area for savings is in providing personnel protections from hot equipment. Replacement of lost labor is expensive. Workers’ compensation and insurance premiums cost money. However, more importantly, there’s far more than an economic cost when someone becomes unnecessarily injured. these products are absolutely 100 percent, 24 karat solid gold.